Here, in this historical centre (Old City) of Sultanahmet Istanbul, with comforts that can only be offered by the finest of Istanbul hotels, and with the unique hospitality that only Rast Hotel can provide, you can experience the real Istanbul in an environment which was shared by emperors and sultans. 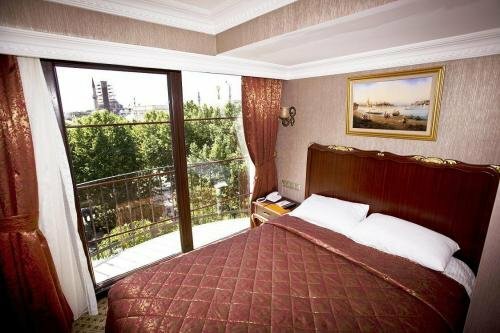 Rast Hotel is positioned on the historical peninsula of Istanbul and has a view that includes two great works of architecture, the Blue Mosque and Haghia Sophia. Our hotel is in a fantastic location that allows you to observe the entire historical texture of Istanbul, to enjoy an unparalleled view of the Bosphorus and to breathe the sea air. The unique historical and tourist sights of our city are within walking distance. Sultan Ahmet Square, the Archaeological Museum, Hippodrome Square, Topkapı Palace, the Binbirdirek Cisterns, the Basilica Cisterns, Haghia Irini Church, the Turkish and Islamic Works Museum, Constantine’s Column, the Grand Bazaar and the Spice Market are just a few of our neighbours.